The FAMIUM Multiscreen Advertisement solution addresses the needs of broadcasters and content providers to schedule and distribute media content (on-demand or live) to multiple platforms easily. 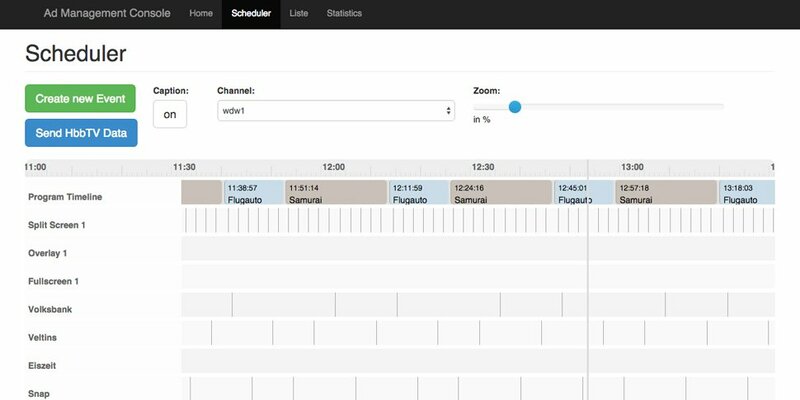 By supporting the HbbTV standard, as well as MPEG-DASH, devices from both worlds can be reached from one Web-based management interface. HbbTV is available on Connected TVs and MPEG-DASH playback only requires an HTML5 browser (desktop, smartphone, tablet etc.). Platform-specific inband signaling is used to insert advertisement into the media content. This is to ensure time-accurate playout of the advertisement. In the management interface various options exist to insert advertisement. 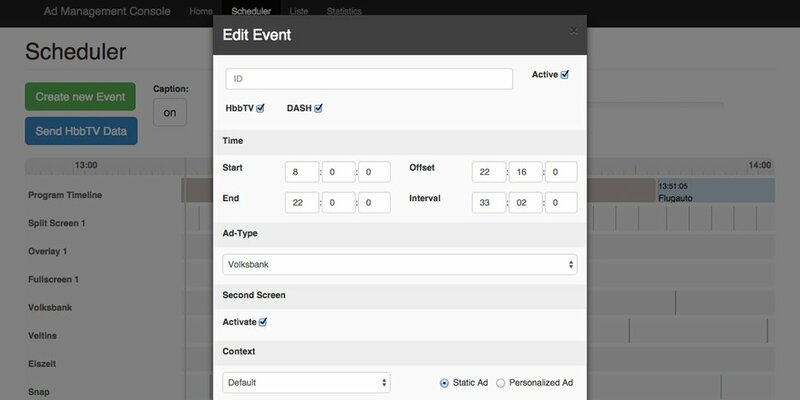 For example, ad slots can be scheduled or dynamic triggering of ads during live events. To stay updated on the latest developments of FAMIUM Multiscreen Advertisement and news of Fraunhofer FOKUS FAME, please subscribe to our newsletter. We show how video content can be delivered across a multitude of devices and platforms via DVB, HbbTV, and DASH. A highlight is the dynamic integration of digital video advertising, which can be integrated in real time, in both classic linear and on-demand TV content. 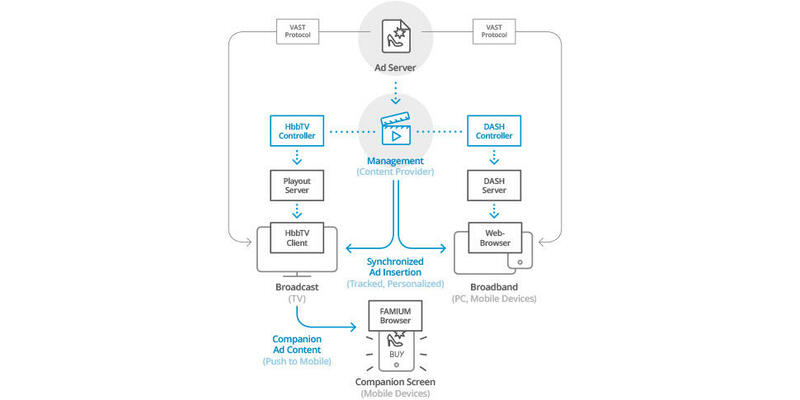 Through the integration of features of the HbbTV 2.0 standard, the technology supports second screen functionality and links video elements and inserted advertising via the HbbTV technology standard. A DRM system can be integrated in order to encrypt content and make it available only to a certain target group, such as for premium services.